Kris Bryant has third base nailed down in Chicago for the foreseeable future and David Bote will still be around to fill in as he did last summer. 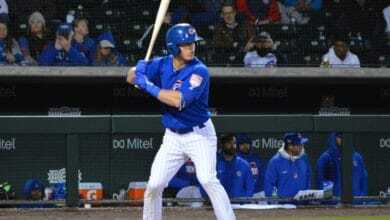 A bounceback campaign from Bryant will solidify things that much more, so the Cubs seem set at the major league level. The minors, on the other hand, offer quite a different story. Outside of Jason Vosler, third base was a hot mess in 2018. Four out of the five top third baseman in the system from last year’s list struggled to produce. Heading into 2019, several things have changed. With Vosler now in San Diego, there has to be changing of the guard at the position. But there’s also been an overall shift in the type of player the Cubs are plugging in at the hot corner. It was rare last year to see a guy play just third base. Instead, they’d move around between the other three infield positions and even the outfield. What was the strength of the system as recently as two years ago has plummeted near the bottom based on a lack of production. But there still is hope. A couple new draft picks and a Latin infusion could change how we look at third base after 2019. It’s hard to compile an accurate list of third baseman when so many guys played there last season. Delvin Zinn, Christian Donahue, Trent Giambrone, and even Chesny Young, primarily second basemen, saw time there last year. We’ll see whether any of them get more steady work at third this coming year or if they continue to be utility players. The Cubs, it seems, are trying to play up that versatility. Odds are good that Trent Giambrone, No. 1 on our second base list, could actually end up atop this list if he sticks at third in Iowa. The MIT product had one of the best Aprils of any Cubs prospect last year. Then it seemed like he didn’t have a day off for over a month. He struggled a bit with a new swing adjustment in June, but rebounded some in July and August. His walk rate of 10.2 percent was one of the best in the system and bodes well for his future. It’ll be interesting to see what changes he’ll make after his first full season as a pro. The 2013 international free agent seems like he’s been around forever, yet he still is only 22 years old. He’s battled injuries most of his career and last year was no different, though he did have a good June in which he hit .290 with one home run and 11 RBI. That didn’t last long as he struggled to even put the bat on the ball in the second half and hovered around a .200 average. Hopefully, he can come to spring training healthy after battling a nagging wrist injury. The power stroke is there, but so is the swing-and-miss, so it may be a matter of getting off to a strong start and finding a little confidence. The 23-year-old Southern Mississippi product was the 10th round pick for the Cubs in 2018. He had an impressive debut season in Eugene, managing a .383 OBP in August despite playing with two injured ankles for most of the month. If he does go to Myrtle Beach, it will be interesting to see how much power he displays in a ballpark where homers go to die. Fidel Mejia tore it up in Mesa last summer, hitting .324 with a .389 OBP and a wRC+ of 130. He will be 20 for all of next season and should be at Eugene when the short season begins. Jake Slaughter is guy to watch as he adapts to being a full-time player. Christopher Morel is another who could break out, especially if he makes it to full-season ball with a good spring. There are just not a lot of full-time third basemen anymore and I’m taking a wait-and-see approach all around.